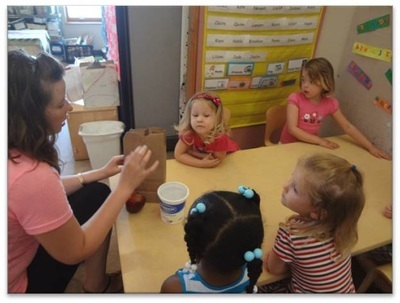 This investigation took place at the Bombeck Family Learning Center which is the Early Childhood Education demonstration/research school for the University of Dayton. This is the birthplace of the ACCESS Curriculum. The classroom environment consists of pre-K aged students and range ages from 3 to 5 years old. This class has approximately 20 children with 3 full time teachers as well as student teachers from the University. 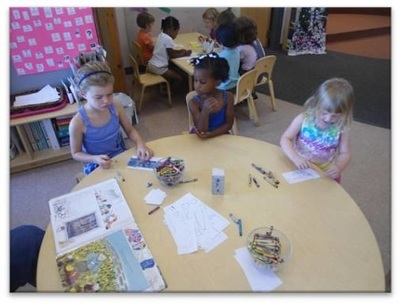 The room is set up for center-based learning and is divided into different areas that include the following centers/areas: dramatic play, manipulative (math) area, block area, literacy/story or book area, art center, science center and sensory tables. The room also includes 4 large tables for group work and eating meals. The classroom is child-centered and provides opportunity for children to choose where they would like to work and play. 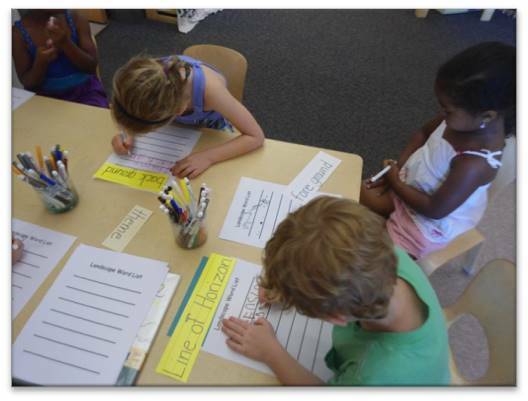 The classroom also offers each child the opportunity to make decisions on what he/she would like to engage in. The class is set up in such a way as the child chooses what learning experiences he/she would like to engage in and at what point during the day as well as the ability to move freely from experience to experience. Moreover, the class schedule creates time for children to participate in teacher directed activities in small and large groups. The class was studying art specifically visual art through drawing and painting. Through art children had the opportunity to express ther feelings and emotions in a safe way. They learned to control their emotions and recognize that they can express and handle negative as well as joyous feelings through positive action. 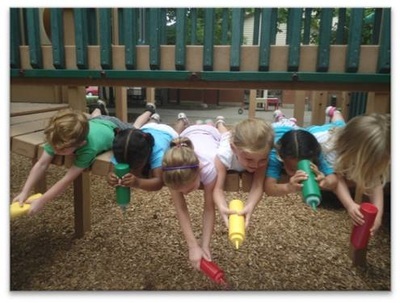 Also children practiced and gained fine muscle control and strengthened eye-hand motor coordination. 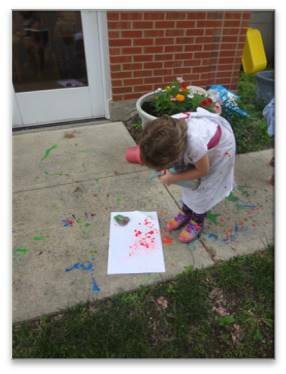 By holding paintbrushes and learning how to control paint, crayons, scissors, and other art tools, the children gained the skills necessary for writing activities as well as a feeling of control over themselves and their world. They developed perceptual abilities. 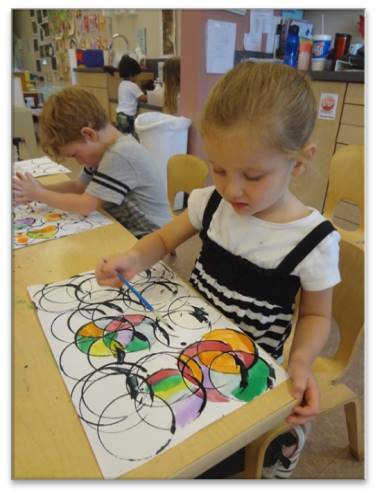 Awareness of colors, shapes, forms, lines, and textures resulted as children observed these and tried to replicate them through art. 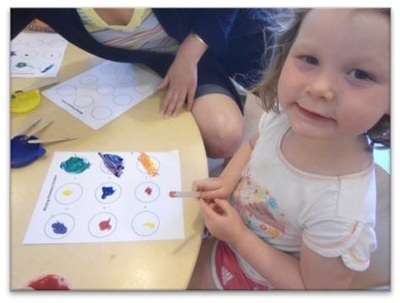 The children were given the opportunity to make choices and solve problems through art. Some of the challenges were: "How do you get the legs to stick on a clay figure? What color should I use?" 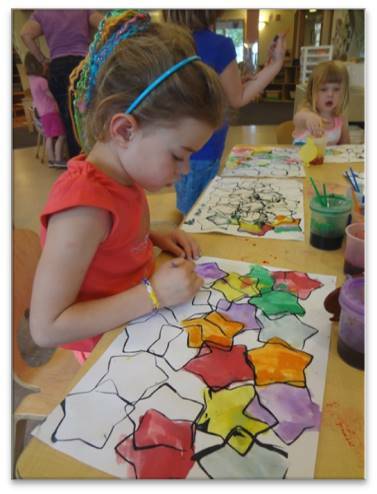 Making art offered the children a multitude of choices and many decisions to make. 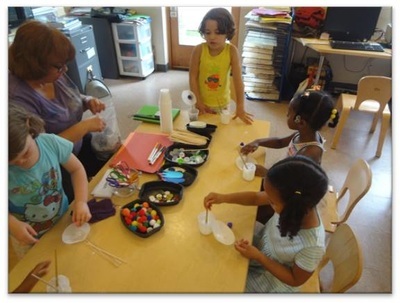 They also had the opportunity to see that other children had differing points of view and ways of expressing themselves. 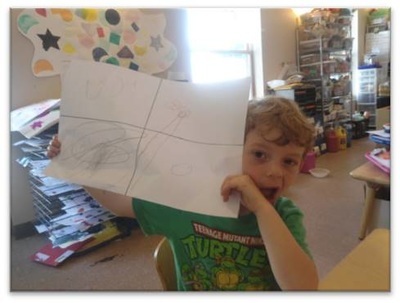 Comparing children’s drawings, paintings, or models gave the children concrete, dramatic examples of how different people express the same thing in different ways. While learning that their way was not the only way, they learned to value diversity (Strasser, 2001). 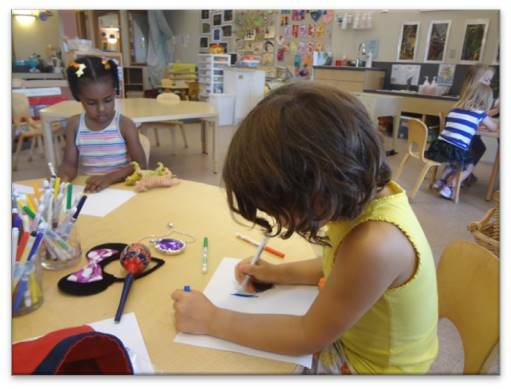 Through art, the children experienced success. Because art leaves the end open to the creator, all children experienced a measure of success, and they could make connections between the visual arts and other disciplines. 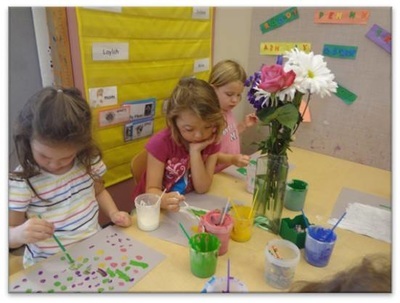 Art integrates the curriculum. Content from every subject matter can find form through art. HOW THE TOPIC RELATES TO S.T.E.M. 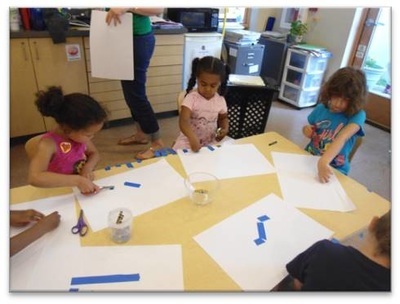 Create shapes during play by building, drawing, etc. -With modeling and support, determine the meanings of unknown words/concepts using the context of conversations. WHAT IS ART? WHAT DOES ART MAKE YOU THINK OF? WHAT DO YOU KNOW ABOUT ART? Quinn- "It’s like a rainbow…can be a lot of things too...you can draw anything you want." Claire- "It’s a rainbow…it’s the sun…make red orange, yellow, blue, and purple." Penny- "I like making drawing…I like technology about the outside world…I do great science work and doe what my mom says at home." Hagen- "Artwork is when the moon comes up…when you fix building things…when you build the track." 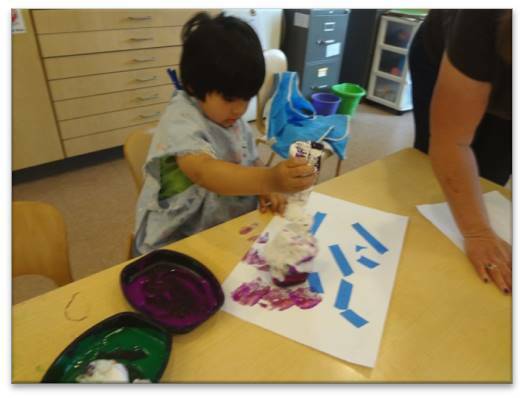 Liliana- "Art looks like a rainbow…it looks like beautiful way to do stuff of making beautiful stuff…beautiful ways to paint…putting on the drying rack and taking it to your parents to say its beautiful." Landon-"Art means you gotta something that you feel…what you wanna do…you can do something like draw crayons pencils and paint." Rosie- "Drawing falling leaves when they fall from the tree." Avery- "When you mess up you don’t mess up." Kate- "It’s like you color some stuff and you make it out of shapes you also color inside then you let it dry you have to color it when it dries…it dries in a few minutes." Eva- "A beautiful panting...it could be beautiful or bad." Brooklyn- "Paint, drawings…about making stuff…writing stuff…numbers and letters." Jackson- "I know that I think it’s something you make like a portfolio…something good that you want." Maya- "It is something good or bad well it’s fun and never tried before." Kaya-"Art is what you paint…paint something that you like." Laylah-"Art means you write something for mom and dad…my mommy loves art because she likes art." After reading the book The Dot the children used their fine motor skills to cut out circles. 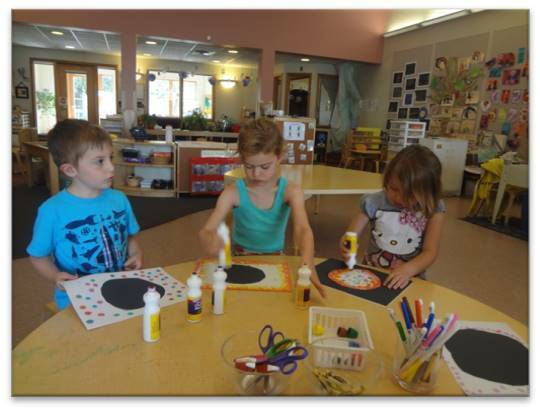 They then used dot markers to create their own dot artwork for one activity. Another activity involved the children using a black marker to make a dot on a piece of paper. From there they made their own creation. 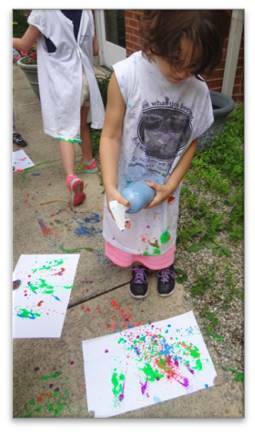 The third activity involved using milk, food colors and dish detergent. The children observed the changes in the way the food colors dispersed after the dish detergent was dropped in. Using the primary colors, the children mixed 2 different colors to come up with secondary colors. 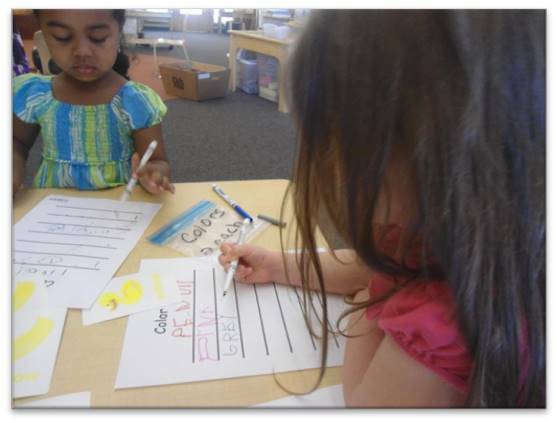 Using the different colors they created, the children then charted their findings. ,Different types of music were played for the children to evoke different emotions. While the music was playing, the children were asked to make a drawing of how the music made them feel. 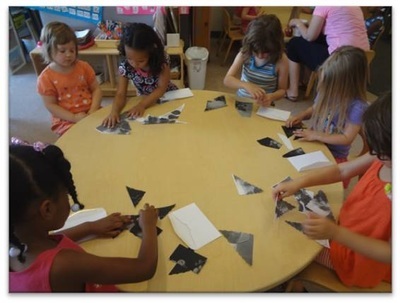 To create different shades using black and white the children were given 1 cup each of white and black and were then asked to see how many different shades they could create. Using cotton swabs, they made marks on paper of the different shades they came up with. Using a variety of methods, tools and media, the children explored mixing the primary colors to produce secondary colors. 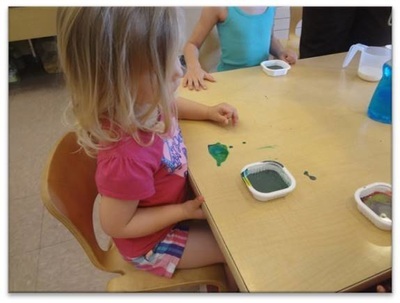 From there the children experimented with creating even more colors and shades. Using their fine motor skills to make a list, they practiced writing words related to colors and mixing. 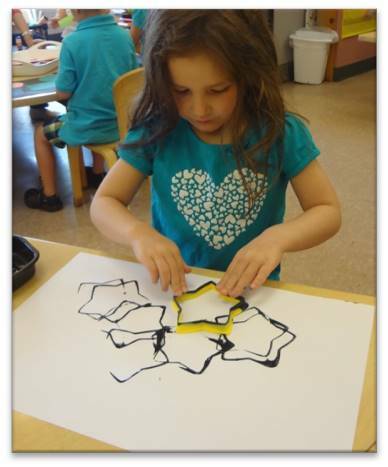 Using bottles of paint, different shaped cookie cutters and pieces of paper cut into different shapes, the children created works of abstract art. The children work together on some of the art pieces while others were individual endeavors. 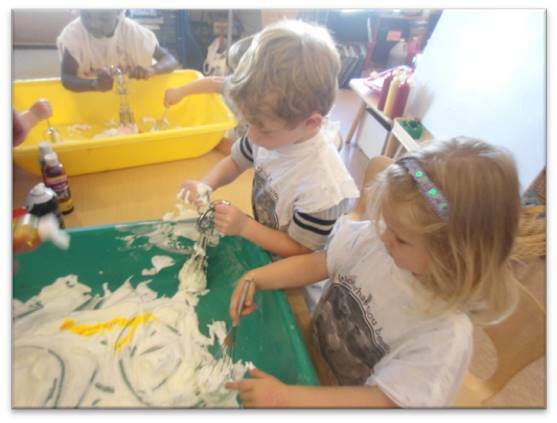 The children also experimented with different places in their environment to make their creations. 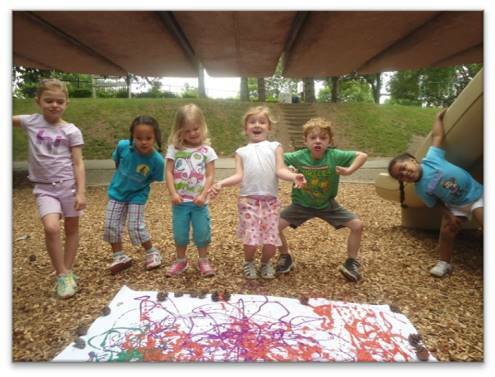 For one activity the children used socks filled with mulch, pebbles and rocks along with classroom items to create collaborative works of art. 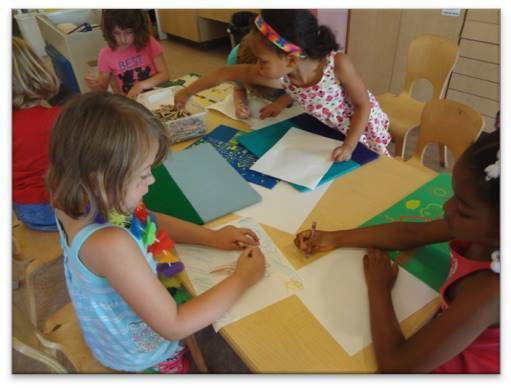 In another activity the children painted their designs on a piece of paper using water colors. 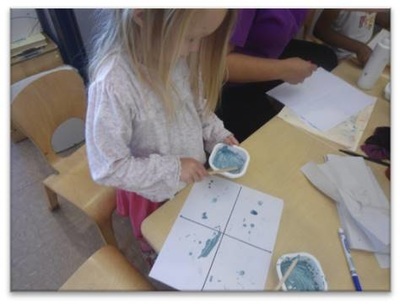 They then added texture to the piece by using glue, salt and glitter. 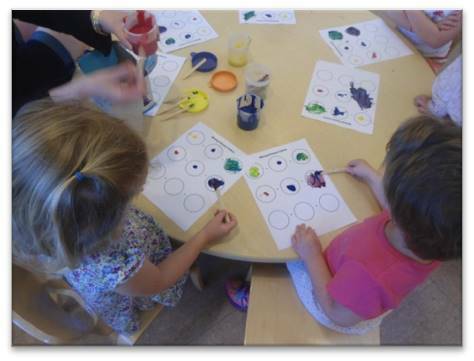 The children also completed their shape creations by using paint to add color to their previous works. 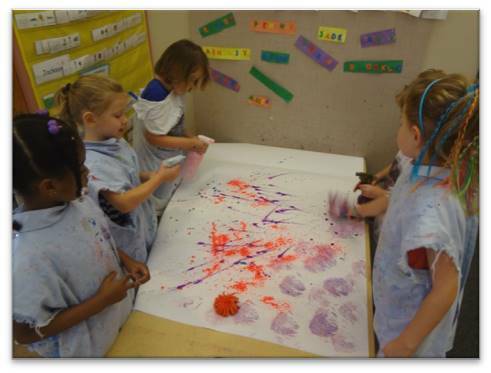 Using spray bottles, the children used simple tools to extend their investigation of abstract art. They also used muscle control and coordination skills to make their creations with the spray bottles. The children created an abstract word list using words that pertained to abstract art like: spontaneous, canvas, layout, and shades. 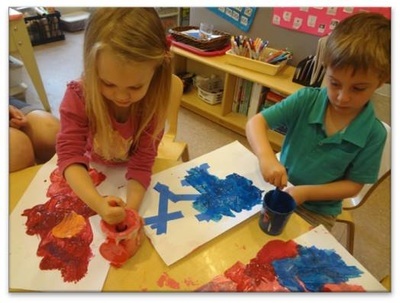 The children participated in a variety of activities to create different forms of abstract art including painting with different materials from the environment as well as using classroom materials. Stories were read that introduced vocabulary pertaining to abstract art and famous artists who created works of abstract art. The children made a word list of terms associated with abstract art. Still life is a painting featuring an arrangement of inanimate, everyday objects, whether natural objects (flowers, food, etc.) or manufactured items (books, bottles, etc.). Still life activities included looking closely at three different objects. 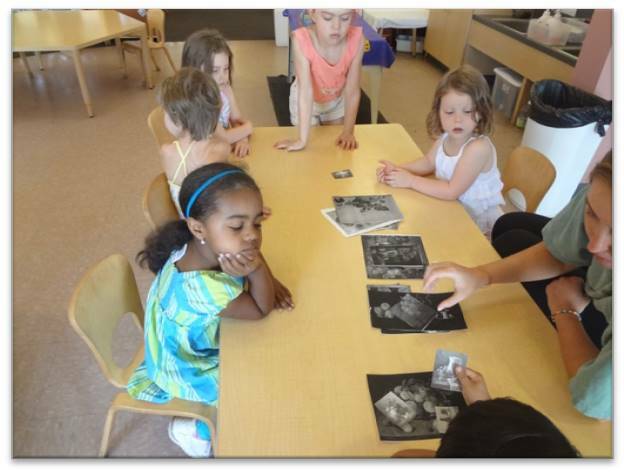 The children examined the three objects looking at shape, color, and texture and material composition. Each child then made a plan as to how they would position the three pieces to draw. They also studied an arrangement of a group of blocks and then made a drawing of the arrangement. The children made a still life word list using their fine motor skills to help with their understanding of new words. 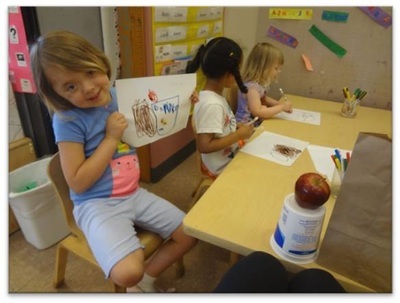 The children discussed the detail of three objects which were an apple, a paper bag, and a yogurt container. They looked at the color, shape, shadows, light reflections, texture, etc. The next day the children observed an arrangement of these items on the table. They used pictures of the objects to place them in the correct position on their papers. Lastly they used markers to draw the arrangement. During this experience the children demonstrated an understanding of positional words by correctly placing the objects next to, in front of, behind, etc. on their paper. The children had the opportunity to paint typical objects found in famous paintings such as a bowl of fruit. 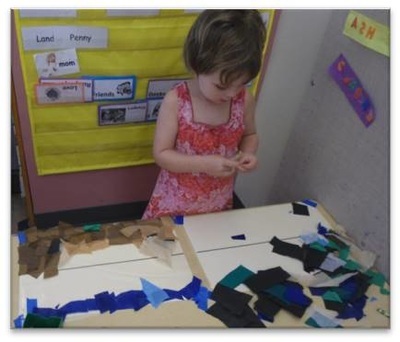 Through these experiences the children were able to demonstrate their ability to make careful observations and refine their fine motor skills by adding small details to their work. 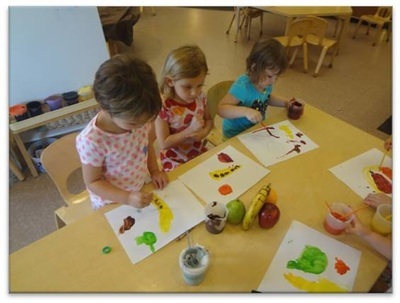 The children had the opportunity to paint typical objects found in famous paintings such as a bowl of fruit and a bouquet of flowers. Through this experience, the children were able to demonstrate their ability to make careful observations and refine their fine motor skills by adding small details to their work. They also created their own arrangements by making flowers and by arranging items from home to draw or photograph. 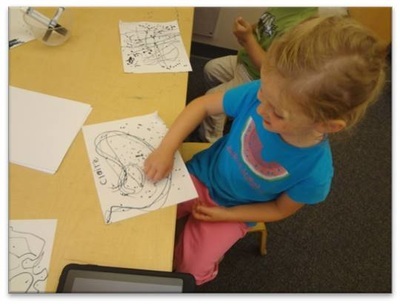 Through this experience the children were able to demonstrate an understanding of position words and use technology tools to share their experiences. 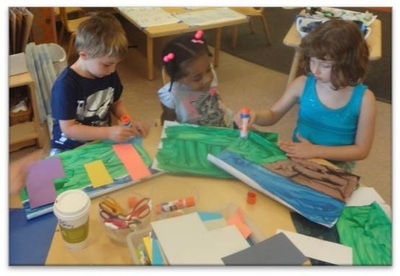 During our art investigation, the children discovered that landscape is the depiction in art of natural scenery such as mountains, valleys, trees, rivers, and forests, and especially art where the main subject is a wide view with its elements arranged into a coherent composition. Through searching for famous landscape art and describing elements found in landscape art, they used felt boards as a model to create their own landscape theme. 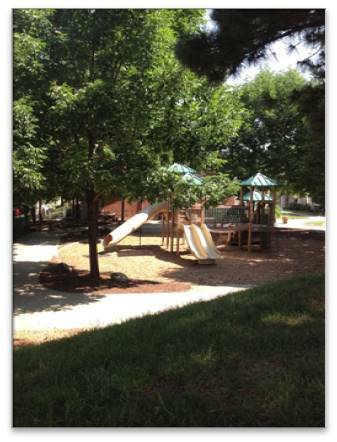 The children also used a camera to take pictures of the playground landscape. Through this experience the children had the opportunity to demonstrate their ability to record observations with pictures and express understanding of new words. 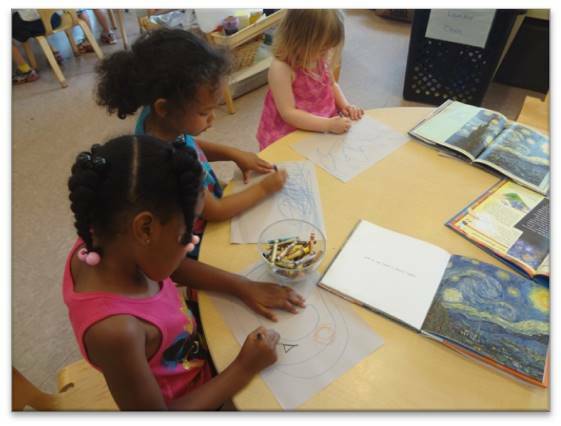 While exploring landscape art, the children reproduced the famous painting Starry Night by Vincent van Gogh using crayons and gray paper. During this experience the children were asked to look closely at details including shape, color, etc. They also had the opportunity to show appreciation and interest in other's work. 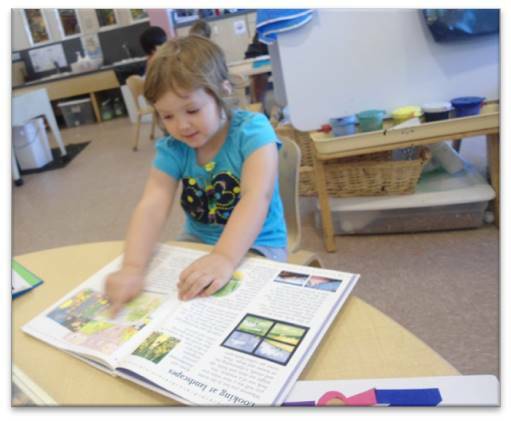 The children also used books to choose a theme for their own landscape work. They started their work by drawing a line of horizon to show where the sky and ground met. 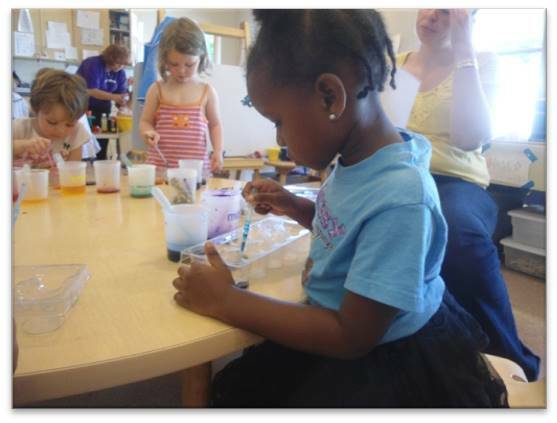 Through this experience they had the opportunity to learn a new word and refine their fine motor skills. 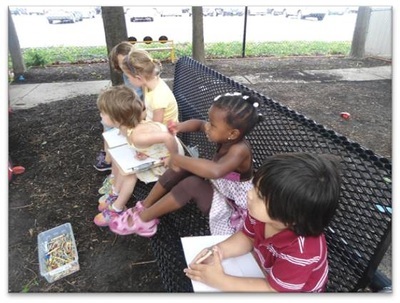 In small groups the children chose a piece of landscape from our playground to draw. 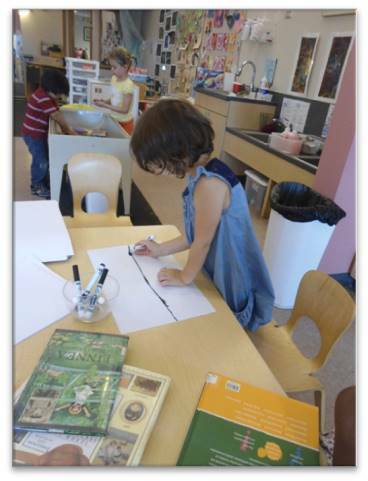 During this experience the children were made careful observations of details, composition, and recorded their observations. 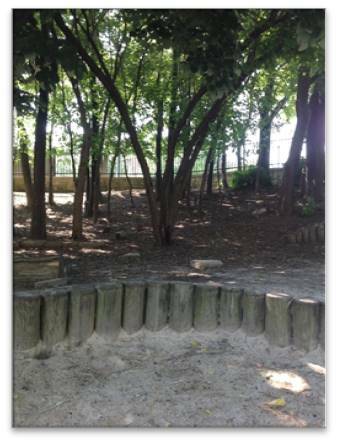 The children discussed new words during this project: foreground, background, and middle-ground. During our investigation of landscape art, the children used paint to paint the foreground and background the color that matched their theme. 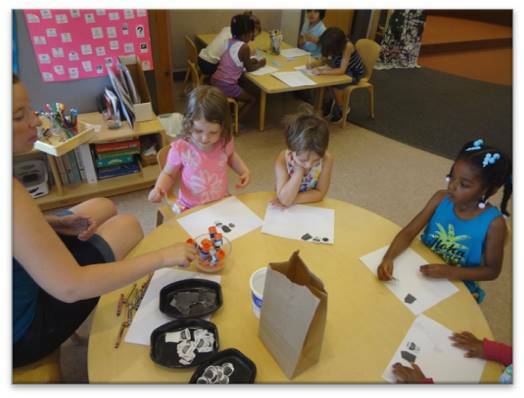 Through this experience they had the opportunity to learn a new word and refine their fine motor skills. After experiencing many new words the children look at the new words they learned and made a list of important words by printing them on paper using a model. Through this experience the children were able to demonstrate an understanding of the words and refine their letter formation skills. 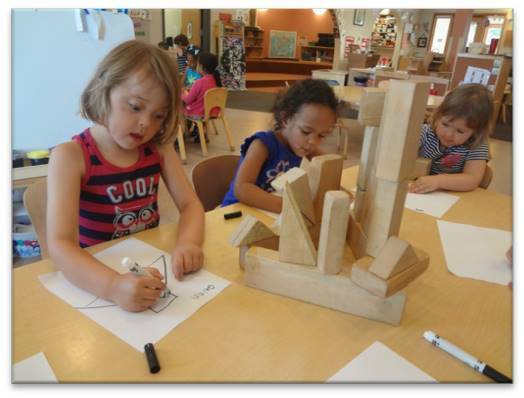 To look at composition and dimensions further the children created buildings with blocks and paper. The next day they will use them to create a city with depth. While investigating landscape art, the children used small pieces of paper to add objects to finish their landscape piece. 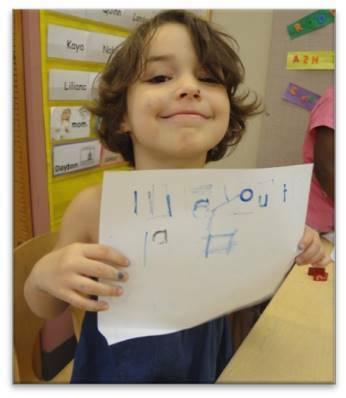 Through this experience they had the opportunity to learn a new word and refine their fine motor skills. 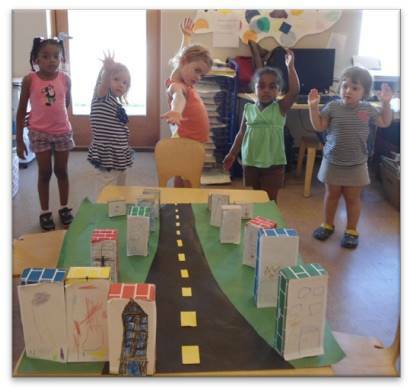 To look at composition and dimensions further the children created buildings with blocks and paper then placed them on the road to show depth. They were able to discover how to show dimension in art. They found that the items closer were larger and decreased in size as they got further away. 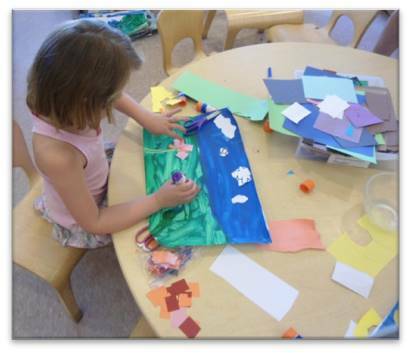 Lastly they created landscape art by using contact paper and tissue paper to create ground and sky using a line of horizon. 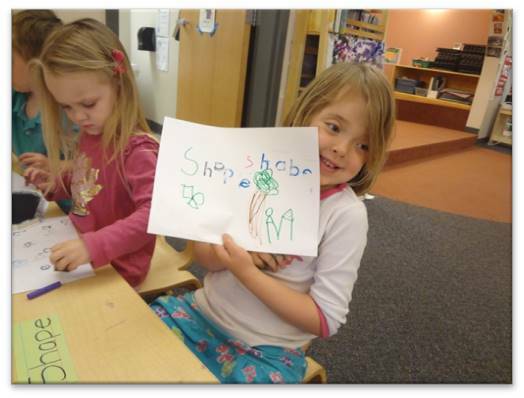 Then they traced and cut an item and added it to their picture. Developed by: Shauna M. Adams, Ed.D, Joy Comingore,P. D., Ed. D., M. A. Copyright © 2014 ACCESS Curriculum. All Rights Reserved.